The first sighting of a Writing Spider (Argiope Aurantia) can be a bit unnerving. The body alone is more than an inch long. Yet despite their intimidating size and threatening appearance, they’re actually quite harmless …and with a healthy appetite for grasshoppers and other garden pests, they’re nice to have around your tomato plants. The female, pictured here, spins a nearly-invisible web — except for the characteristic white zigzag pattern at the center. According to legend, if the writing spider spells your name in her web, your days are numbered. 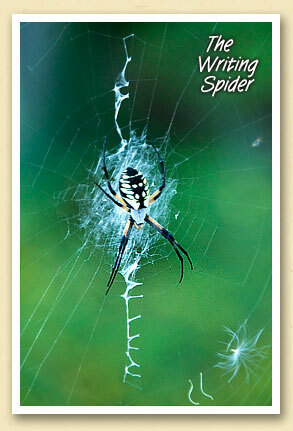 This spider was photographed on the porch of a Bryson City cabin, but they can be found in temperate climates worldwide.